If you sit at a desk all day you will know that something doesn’t feel quite right. In fact, sitting at a desk for long periods of time can actually damage your body. Your posture is incredibly important to you and your health, and if you are doing something that requires very little changes in posture, like desk sitting, you’re looking at a very worrying situation. Some people recommend adjustable height desks, standing desks or treadmill desks. These two options are all well and good options to consider. Your eyes are staring at the screen for long periods of time, but putting aside the damage they receive, the position your computer monitor is in can be very important. Depending on where your eyes focus on the screen, you could be leaving yourself open to all kinds of terrible conditions if you don’t take action. For example, looking down at your screen puts a large amount of strain on your neck, and this causes untold difficulties at a physical level. At the very least you could be looking at severe headaches, but you can also face hernias,and cervical strains. This is something they definitely don’t tell you in your job interview. Monitor Arms are going to be your best friend. Humanscale makes a series of excellent line of Monitor Arms with people who work on flat monitors. Now for some of you who work on a laptop there even solution for you! It’s called the L6 from Humanscale. 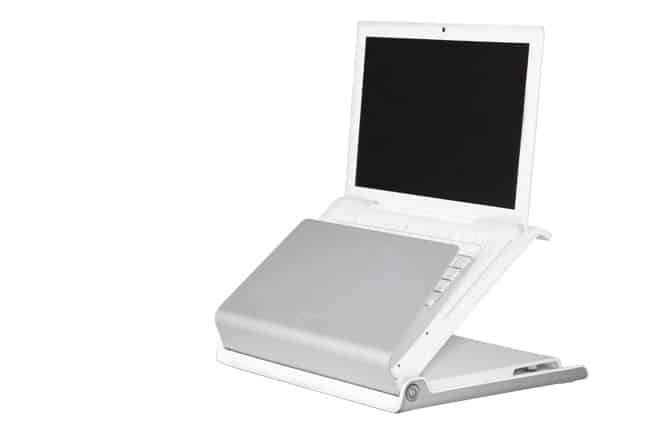 It gives you the flexibility of viewing your laptop screen like a monitor arm, but with the flexibility of having it mobile. Otherwise, you’re going to be putting your neck through Hell. Another great idea in this regard is to pick up a good adjustable height ergonomic chair. 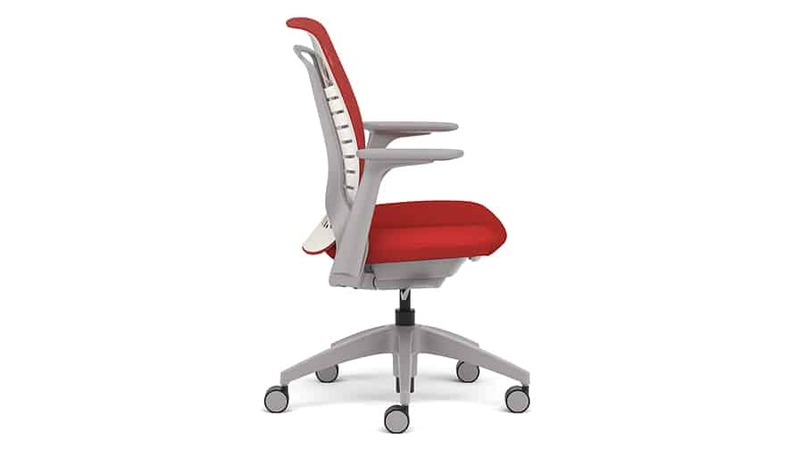 We recommend Allsteel’s Mimeo Chair as the seating of choice for ergonomics! Having a chair like this would will allow you to get to a position where you can give the screen your attention, without giving your neck soreness. 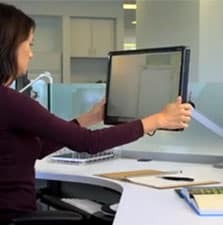 Your line of vision should be absolutely perpendicular to the monitor if it is to ensure you don’t suffer any soreness. Think about the things that you have on your desk. This can mean bottles of water, or your mouse, for example. They have to be nearby because otherwise you are essentially giving your body physical stress by reaching for them constantly. The general idea is that you keep them within reach. Humanscale has this really unique mouse called the Switch Mouse. 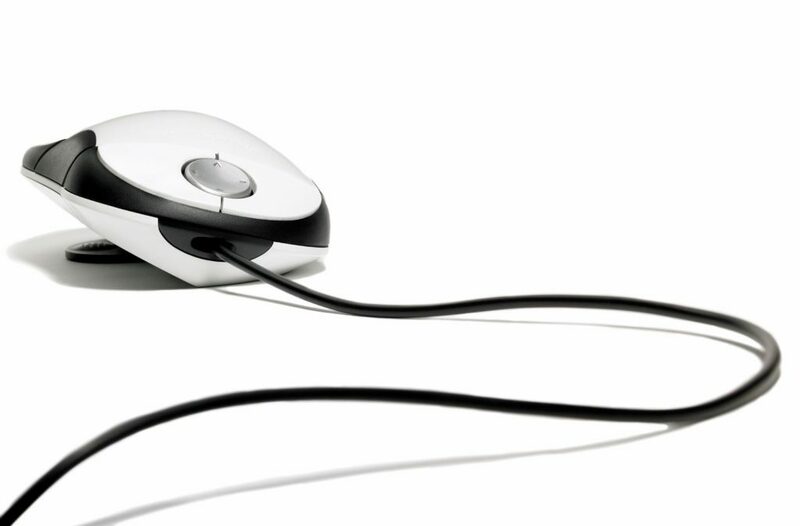 The Switch Mouse is a next generation mouse system that brings unprecedented ergonomics to computer users. Armrests are making a bit of a comeback in the style stakes, but they also prove to be incredibly useful for your posture. Keep your arms in a nice comfortable position using armrests and they should be at a 90 degree angle. If this is the case, they’re doing fine. Otherwise you are looking at serious back pain over time. The best thing you can do here is find yourself a good ergonomic chair . These work really hard to ensure that you get the best possible sitting position, and most importantly they always have armrests on them. Sounds dead simple, but you’re able to look after your back and, most importantly in this situation, create a position that looks after those arms. The whole thing comes together to give you great posture (and a preserved back and arms). This is a key area, and it is also an area that gets a lot of trouble over time. You need to look after your back really carefully or you could face some serious issues that could bring major damage. Putting it bluntly, you could leave your back open to facing serious issues if it is not gently curved in the lower area, and this is commonly known as hunchback. Instead of grabbing pillows from your home, invest in something that was made to solve this issue. A company called Relax The Back has an array of seating solutions to provide that quick chair comfort and posture fix! Of Course, Ergonomic chairs are again a great part of the solution here. But one little-known aspect that really makes for a great result is a chair that simply has an adjustable height. We know these have been around for a long time but there is a reason for this. An adjustable chair means that you can raise your height when necessary, or lower it. This means that you won’t be straining and having that bad posture thing going on. These are really important parts of your body, and the way you treat them when you are working is a key issue. Bearing in mind that most people sit at their desk for hours on end, the legs take a real battering. Back pain, sore arms and neck, the list simply goes on and on. One of the best ways to get around this problem is the standing desk. 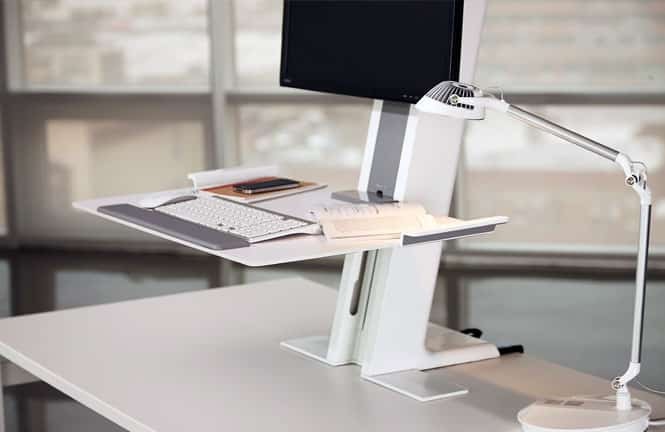 The standing desk is a relatively new development, and it has proven to be very useful for people who have sore legs after working at their sit down desk. Standing up (literally) mean that you put less pressure on your whole body, and your legs. You get movement in your legs that seems natural and actually is, and you have a situation where you can move about more freely. This works on all parts of your boy, but especially your legs. Failing that, simply move about. Walk around your office more than you used to. This gives more exercise to your legs, and helps with the posture. There are two solutions to make this possible. Quick Product Description: QuickStand seamlessly transforms any fixed-height desk into an active one, promoting collaboration and well-being in the workplace. 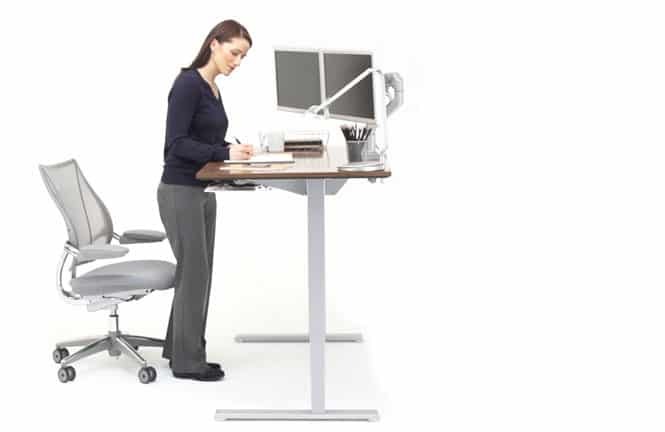 Quick Product Description: Ease of use is at the heart of Float, as it seamlessly adjusts between sitting and standing postures without interrupting workflow. Ergonomics is not just something to just “have”, it is something the body and your employee’s “need”. The overall health, well being, and productivity will pay dividends to your business and staff’s happiness. If you are interested in learning more about what ergonomic furniture that would be the best for your company or any the of the products we mentioned, please feel free to contact us!